the authorship and rich narrative of the craft. via proceeds from sales of the Future Heritage Collection. original designs by Anna Sheffield, reprised vintage jewelry, and likeminded collaborations. the original Southwestern craft, while telling the origin story of its materials and makers. Made in New York by skilled diamond setters, each piece attests to the highest standards of craftsmanship and sustainability. One-of-a-kind designs feature rare, gem-quality turquoise of single Southwest origin, often mined decades ago, set in recycled gold and embellished with reclaimed diamond melée. 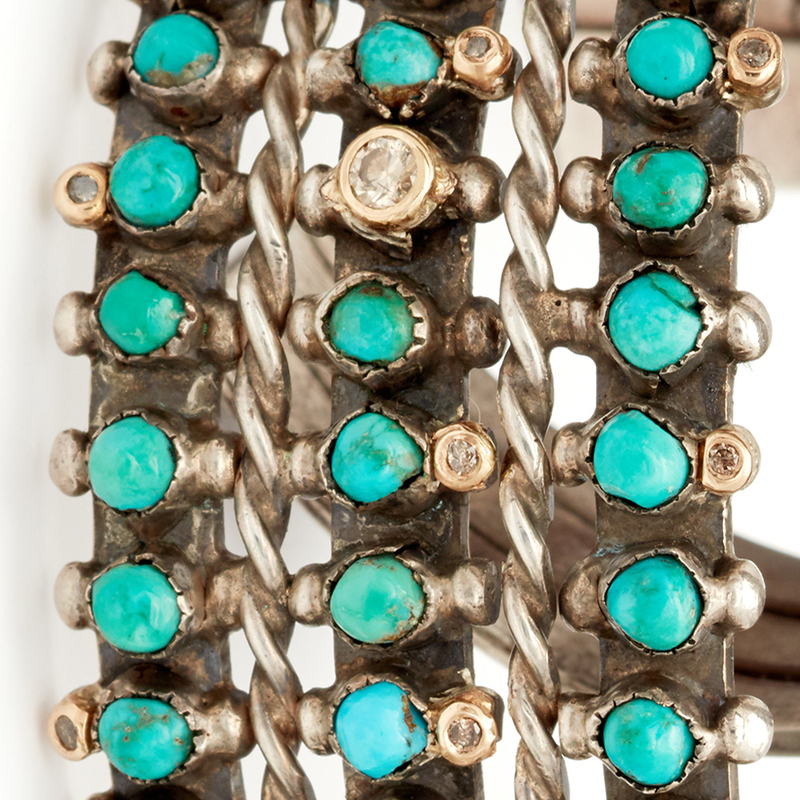 Reprised vintage pieces are inspired by the collaborative spirit of Southwestern jewelry design. Vintage jewelry is reprised and reinvented with gold and diamonds, updated with contemporary fastenings, and honored by replacing missing turquoise with diamonds that reflect the rare nature of the original stones. The effort to maintain the integrity of the work, while continuing to tell the story of the origin and processes of its makers, is evident in every piece. 20% of sales from The Future Heritage Collection benefits The Future Heritage Fund. Founded by Anna Sheffield and created in partnership with the New Mexico Community Foundation (NMCF), the fund allocates monies to a range of cultural, environmental and educational non - profit organizations in New Mexico. To date, the NMCF has raised more than $50 million in grants and scholarships to positively impact hundreds of 501(c)(3) non-profits in New Mexico. of the natural environment of the Southwest, and support of the education of its inhabitants. empowerment through education, economic self-sufficiency and expression of artistic and cultural traditions. of New Mexico’s water and the communities that depend on it. wild places, wild rivers, and the health of the American West. Anna Sheffield’s childhood in the Southwest has had an enduring influence on her work as a jewelry designer, setting the stage for a lifelong interest in natural beauty, spirituality, and indigenous arts and crafts. 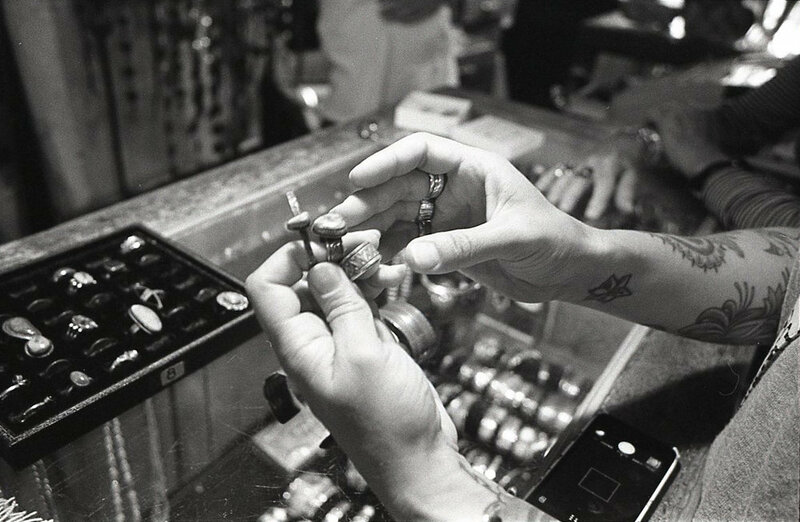 For Anna, jewelry is more than ornamental; each piece is a precious talisman, imbued with history and alive with meaning. The most fulfilling part of her work is knowing that her creations are both dear to those who possess them, and destined to be passed down for generations. from new collection launches to stories from the NMCF and the beneficiaries we fund.